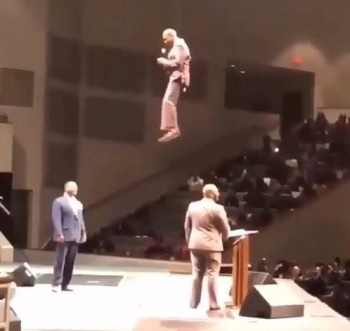 A pastor has become a sensation on social media after he descended above into the church auditorium leaving congregation members amazed. Pastor Bartholomew Orr of Brown Baptist Church, Memphis left his congregation members shocked after he entered into the church building flying on a zip line. The entrance which was perfectly in line with the message of the day “Jesus’ return” has generated a lot of reactions on social media.